Our current coffee and tea offerings. New offerings will be announced on our blog and social media! Sweet and balanced. Wonderfully smooth with hints of apricot and peach. Medium body with an awesome bittersweet cocoa finish. A black tea scented by a traditional Chinese method with the juice of freshly harvested lychee berries. Highly aromatic, distinctly sweet and fruity, with a lingering finish. A classic Japanese sencha. Slightly astringent, robust and grassy with a delicious umami finish. Processed with a deep steam (Fukamushi) and shaded to concentrate chlorophyll. Just ginger root and water. Our organic ginger tisane is, all at the same time, refreshing, zesty, sweet, and has a complex earthiness. Every drop of coffee or tea we brew is hand crafted in small batches using the best quality ingredients available. The most important link between farmer and brewer in coffee is the roaster. We are extremely honored to work very closely with Troubadour Coffee Roasters, one of the best small batch roasters in existence. So here's the flow- we buy green coffee, Tony at Troubadour roasts it for us, we brew it within a few days of roasting, we deliver it to you within a few days of brewing. Simple and amazing. Check out our blog for more articles and info about coffee and tea. So whats all this about "specialty grade" and "high quality", whats the difference... a beans a bean, and a leaf is a leaf. NO not true. The green coffee we buy is directly sourced from small farms or co-ops that are run by true artisans. They put more work into the products than anyone. Each lot of green coffee is hand sorted up to three times to remove all the stuff that tastes bad, dead beans, sour beans, damaged beans, black beans, corn, rocks, sticks, bugs, withered beans, immature beans, cherries, parchment, etc. All that stuff that adds weight and defiles the flavor in lower grade coffees. We don't use the stuff that gets swept up off the floor and put in a can. The same ideas apply to our tea. We are currently working with Silk Road Teas. Catherine and Ned Heagerty travel each spring to the southeastern provinces of China to source the finest small lot, single origin, & handcrafted teas from small farmers, tea markets, specialty tea companies and brokers. The teas they source are produced by true artisans of the leaf, and we dig that stuff. We don't soak our beans in a bucket. No. That's boring. We use Yama Towers for all of our coffee brewing. This is a big glass tower (picture above) that works like this: A container at the top holds 3 liters of water, that water drips through a brass valve at roughly one drop per second (this varies based on temperature, humidity, etc.) over 10 - 12 hours. The drops fall into another container holding all the ground coffee, slowly extracting all the delicious flavor as the water flows through and then the coffee passes through a ceramic filter in the bottom of the container, goes through a coil and into a container at the bottom of the tower. When its all done we bottle it fresh and put it into the fridge to make it nice and cold before it gets delivered to you. Ok so... we do soak our leaves in a bucket, and its a little boring. They're 18 quart buckets with some cold water, then we put our loose leaf tea into some pillowcase sized filters so it has lots of room to expand and release all that amazing flavor without getting all smashed and broken in smaller filters, that messes up extraction. The leaves chill in the buckets 12 - 15 hours depending on lots of things like the type of tea and stuff, ask Tyler if you really want to know, he loves talking all nerdy about brewing processes. When its done we take the filter out, filter the tea again to make sure you don't get any stray leaves, then bottle it and let it chill some more in the fridge before it gets all warm in your belly. It may not be as fancy as the coffee process but it makes the best damn bottle of tea, and that's how we like it. Owner, founder, brew master, barista, coffee scientist, coffee & tea nerd, delivery rider, etc. Mark- Owner, Founder, Coffee nerd, Etc. Social Media Expert, cold brew taster, coffee and tea nerd, marketing genius, writer, editor, general creative adviser, delivery rider, bike racer, etc. Cold Bloom Coffee officially launched in October of 2015 with the idea of making great cold brewed coffee and tea more convenient. We couldn't find any consistently great tasting, or convenient cold brew in the area so we started making our own. We decided that since the idea is to make it convenient for everyone we should deliver it directly to them and sell our products at other amazing small businesses in the area. Now you can buy our products all over the city, and the list is always growing! Tyler does the brewing and has been a professional barista for a while and has been perfecting our Yama Tower recipe the whole time. 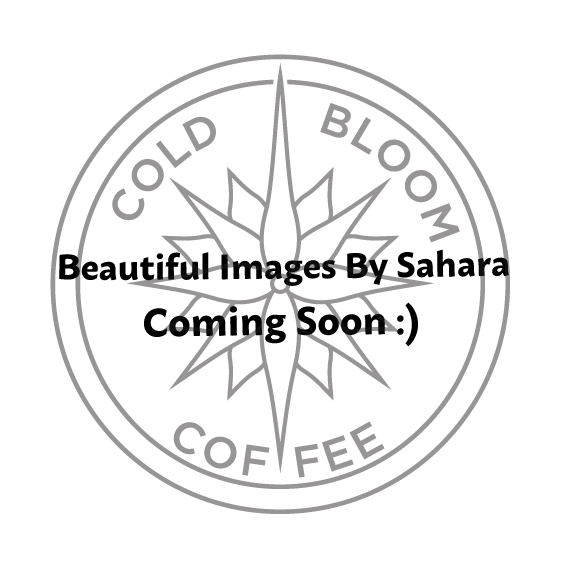 He met Mark who was really excited about the idea, being a huge coffee nerd himself, and with help from Sahara in the social media and marketing dept, Cold Bloom was born. We like to keep it simple and fun, we make great coffee and tea and want to share it with everyone.